The Mexico unit of SolarCity, the rooftop solar developer controlled by billionaire Elon Musk, aims to invest as much as $1 billion over the next five years. SolarCity Mexico President David Arelle said in an interview the projected outlay will depend on Mexico keeping at current levels an incentive known as net-metering that requires utilities to buy surplus power generated by rooftop solar panels. “We estimate that if things work out the way they should, over the next five years our investment could reach about $1 billion,” he said, noting that he sees sector-wide investment as high as $3 billion over the same period. While Mexico has abundant solar potential, it has been slow to take advantage of it, opting instead for cheaper natural gas. Net-metering in Mexico is capped for solar projects at up to 500 kilowatts of installed capacity. But Arelle expressed concern that due to pressure on public finances, the government could push the threshold as low as 50 kilowatts. “That would kill the business,” he said, noting that net-metering was crucial to project finance, providing buyers certainty on the cost of the electricity over many years. Vania Guerrero, a spokeswoman for Mexico’s energy regulator, known as CRE, said new regulations that cover the net-metering threshold will be finalized before the end of the year. She declined to comment on whether the current cap would be altered. Mexico’s state-owned national electricity company CFE supplies power to nearly all residential users and a 2013-14 energy reform promises to gradually dismantle its monopoly. Growth in rooftop solar projects could exacerbate steep losses at CFE, which the finance ministry has to cover. 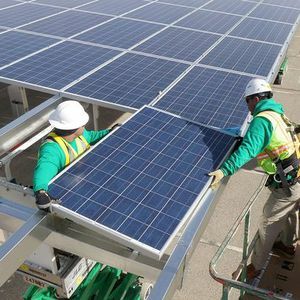 If the 500 kilowatt threshold is maintained, SolarCity could add nearly 2,000 employees over the next two years while other developers create another 8,000 jobs, Arelle said. SolarCity plans 50 megawatts-worth of Mexican solar projects next year, on top of 30 megawatts in 2016. The firm’s Mexico unit, bought in a takeover last year for about $15 million, was SolarCity’s first foreign acquisition.